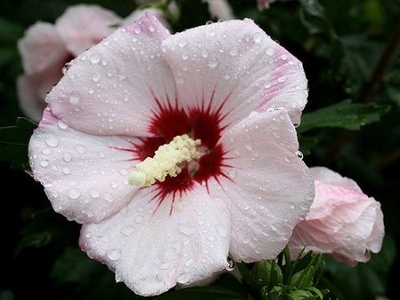 HIBISCUS: Popular for nearly 200 years and with good reason. Its size and growth habit allow it to be planted near a home or in a border, and its flowers are spectacular! Very useful for late summer to early fall bloom. Slow to begin growing in the spring, but makes up for lost time fast. An adaptable plant with soft pink flowers in late summer. May be pruned to shape in spring. Easy to grow. Deer resistant. Attracts butterflies. * Attracts Birds * Attracts Butterflies * Attracts Hummingbirds * Deer Resistant * Drought Tolerant * Heat Tolerant * Landscape Plant. Mature Height: 8-12 feet. Prefers Sun. Immediate shipping in 4" pot.